Former Astros first-overall pick Mark Appel had a tough season in 2014 at single-A Lancaster. Astros organization coaches, including Lancaster pitching coach Don Alexander, worked with him that July on improving his delivery, according to Baseball America. "The process has its own timetable," Alexander told Baseball America. "You want every pitcher to get it right away but some guys do and some guys don't. If you get enough repetitions with it then it starts to carry over. He's got some of the best work ethic I've seen." 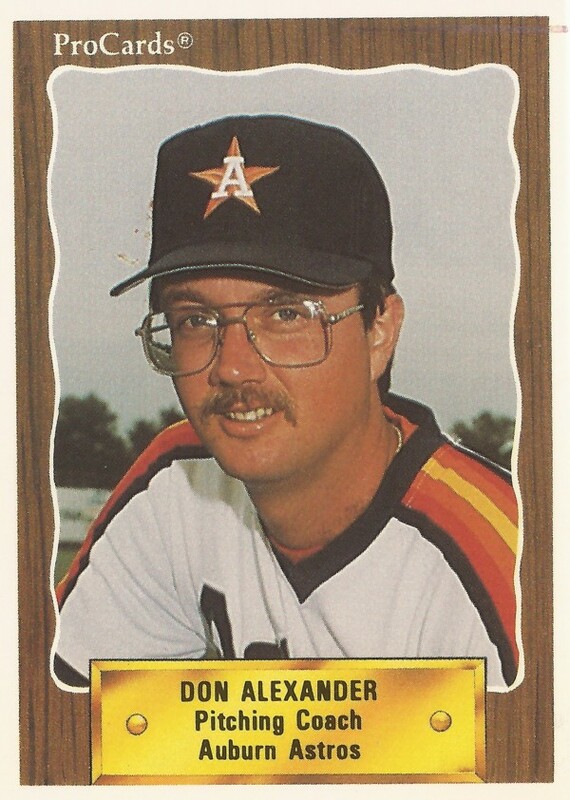 Alexander has spent over a quarter century working with pitchers in the minors, most of that in the Astros system. He's also coached in the Reds and Padres systems. For 2016, he's moved on to the Dodgers as pitching coach at rookie Ogden. 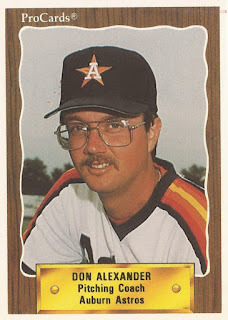 Alexander's career in the pros began in the late-1980s as a scout for the Astros. Prior to that, he served as pitching coach at Mesa College and as a pitching instructor at the San Diego School of Baseball, according to his ProCards card. He didn't play professionally. His first time as a minor league coach came in 1990 at short-season Auburn. He stayed there for two seasons, then two coaching the team's Gulf Coast League entry. He moved to the Padres system by 1997, serving as coach at AA Mobile. He stayed with the Padres through 1999, then had a brief stint in the Reds system. Alexander returned to the Astros system for 2005, serving as coach at short-season Tri City. He stayed with the Valley Cats for four seasons. In August 2007, Alexander watched Carlos Ladeuth, one of his Valley Cats hurlers, take a no-hitter into the eighth inning. "Was it surprising to see him do this well? No," Alexander told MiLB.com. "But was it impressive? Definitely. It was fun to watch him work because he was working quickly and was aggressive in the strike zone." Alexander moved to single-A Lancaster for 2009, largely staying there through 2015. He served as pitching coach at AA Corpus Christi in 2011. In April 2014 at Lancaster, he looked forward to what his staff could do. "You can go top to bottom from the starters to the relievers and it’s an exciting group of arms," Alexander told The Antelope Valley Press. "They're young and talented and they like to work. You put those three things together and you have a chance for something special."